Poca High School originally titled "Pocatalico District High School" is a high school in Poca, West Virginia. It serves the easternmost portion of Putnam County, West Virginia and it is a part of the Putnam County Schools. The school is rated as having 601 students for athletic purposes, placing it in class "AA". The school colors are red and grey. Its original mascot was an American Indian riding upon a white horse in honor to the Native American, Pocatalico, who was killed at the mouth of the Pocatalico River. The current nickname, thought to be unique in the nation and for which the school is mildly famous, is the "Dots" and has been featured by ESPN and Sports Illustrated in several lists of "best school mascots." "The Dot" mascot was first referenced in 1928, during a storming football game when a reporter exclaimed, "they look like a bunch of red polka dots running around the field!" The name stuck and is still currently used. Poca High School first opened its doors in September, 1922 using a small white schoolhouse located on a hillside between Bancroft and Black Betsy, WV. The school then moved to a much larger building overlooking the Main Street of Poca, WV in 1926. In 1970, the school relocated to its current building on the outskirts of town. Over the next decade, Poca High School's then-modern 1970 design was replicated to build new buildings for Hurricane and Winfield High Schools, also located in Putnam County. Thus, while subsequent renovations and additions over the years have introduced unique character, the core sections of three of Putnam County's four high schools share nearly-identical floor plans. Poca High School itself received significant renovation and addition in 2011-2012. Following the high school's move to its current building, the former 1926-era building was used as Poca Junior High (later Middle) School from 1970 until 2012; that building was demolished in 2013 after construction of a new building for the middle school. The first graduating class consisted of eleven students. The first school paper, "The School Echo", was published in January, 1924. Three years later, the first annual yearbook, "The Pocatalico", was published. Since then, there has been an issue of "The Pocatalico" released every year. 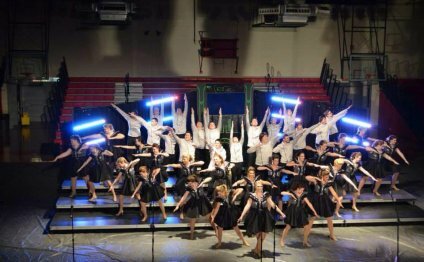 Poca High School is known for fielding highly competitive athletic teams and music ensembles (including marching band and show choir) which have earned the school multiple awards, championships, and recognition on the state, regional, and national stages. Through the halls of Poca High School, loud the echoes ring! May the loyal grads to follow praises ever bring. On the banks of Old Kanawha, beautiful to see! May God bless our student body, praise we give to thee.